With the high winds and snow absolutely dumping, we decided to postpone the Dummy Jump and Snow Bar until next Saturday, March 5th. Same time, same place. 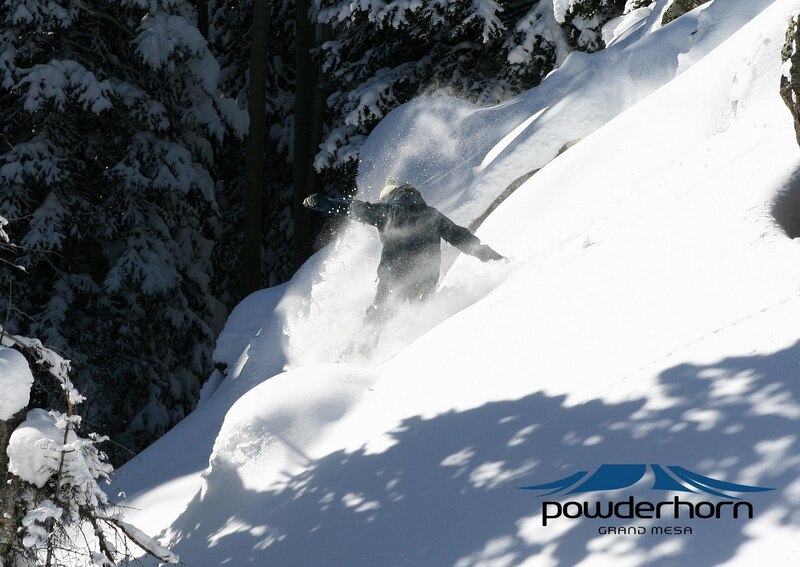 It's a bummer not to be launching dummies today, however the powder definitely made up for it. 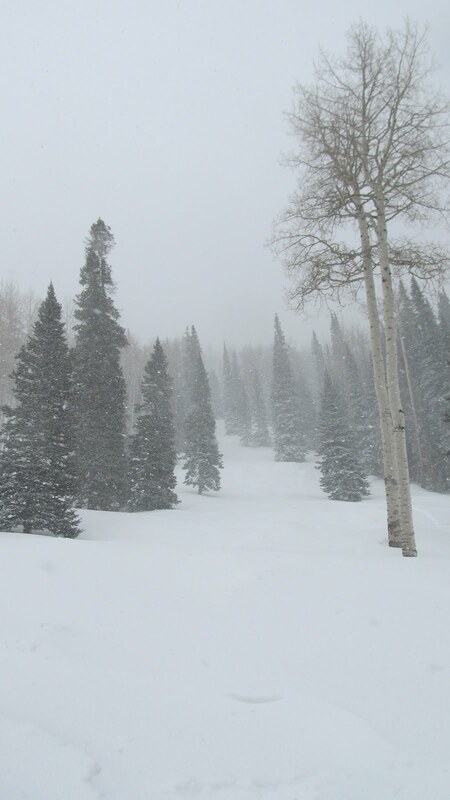 So far today we've received 5" of new snow. 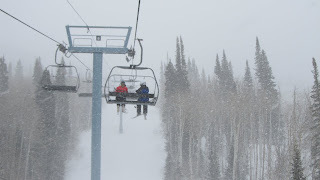 Still dumping! There are free refills on every lap. This week's podcast comes to you from smack in the middle of the Dummy Jump takeoff. You'll have to turn up the volume a little for this one, sorry for the sound issues. The Terrain Park Crew and some of the Rental Shop crew were working hard today, digging the SnowBar out from under the new snow we have gotten, so we can party in there this weekend! Odell Brewing is sponsoring the SnowBar this weekend, Febraury 26. There will be drink specials, a bonfire, a dancefloor, and a DJ all inside this snow fort. Before the party, is one of the funniest and most exciting events of the season, Dummy Jump! It's $10 to enter a Dummy, and free to watch, of course. 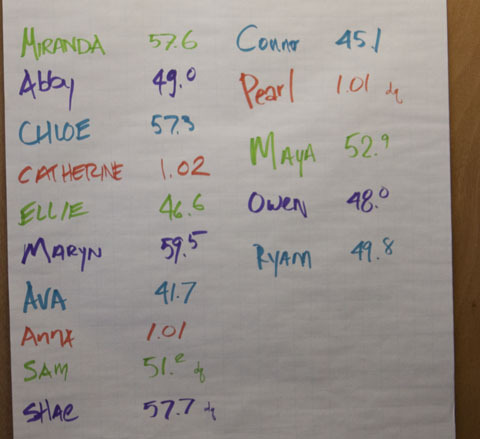 The destruction begins at 5 pm, and judges are looking for the best themes, and biggest crashes! 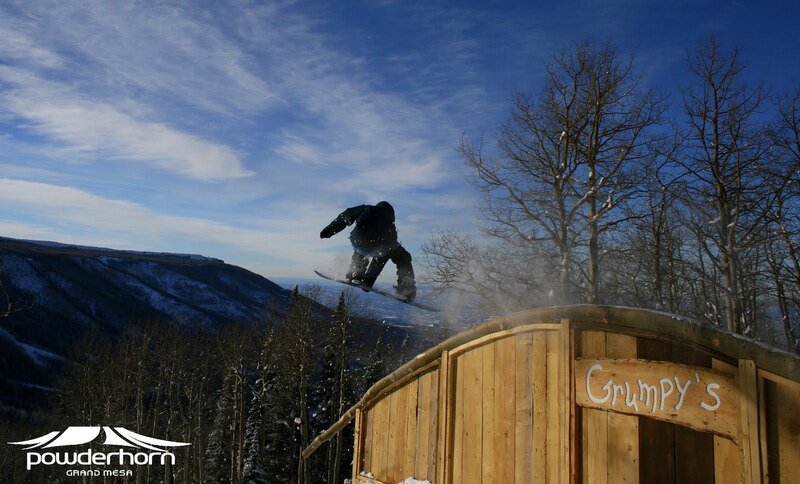 We've got a full weekend of entertainment, relaxation, and great skiing or snowboarding lined up for you this weekend. We'll see you here! Construction of the Dummy Jump has begun! 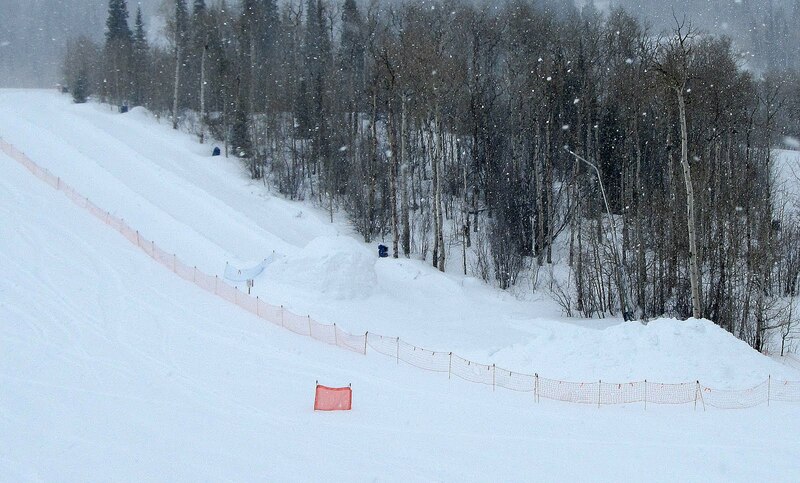 The guys have just started pushing the snow to build up the jump. The track and of course, the carnage-catcher will be coming soon. 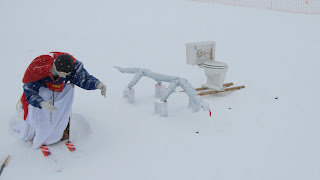 Take a peek at it if you're skiing this weekend. Give it some weight. Dummies need to be a little heavy to pick up the speed needed for a 20 foot jump and serious airtime. Make sure it slides straight. If using skis, measure them at tip, middle and tail to make sure they're perfectly parallel. Have fun with it! Get creative. Materials we've seen used in the past: bathtub, washing machine, wheelchair, keg, and a toilet. Just don't use hazardous materials or fireworks. For a slideshow of Dummy Jump pics from last year, click here. Please have your dummy to the mountain by 1pm. Check in at Guest Services. Our crew will help unload and transport the dummy to the snow. Dummies will be on display at the lift line. 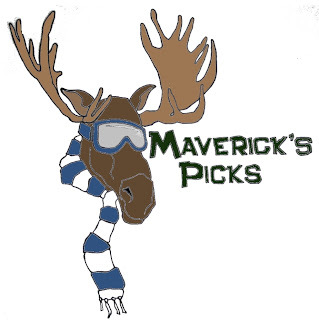 This week's podcast features our roller coaster weather, snow reporting and a deal coming your way. 1. Shoot footage of your friends riding at Powderhorn. 2. Post your video to Vimeo or YouTube and link it to the Powderhorn Facebook Page. 3. Our staff will choose their favorite on April 2nd and announce the selection at the Pond Skim on April 3rd. If your video is chosen, we'll hook you up with a Grenade jacket and 4 lift tickets for next season! Video must contain footage shot only within the boundaries of Powderhorn. Video should be 2-5 minutes long and at least 360p, HD preferred. 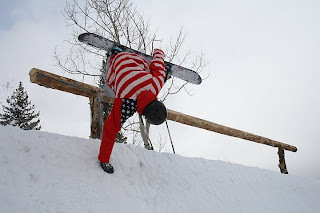 Remember inverts are not allowed at Powderhorn. If music is included, please respect copyrights. No profanity or inappropriate material. If any of these rules are violated, your video will be disqualified. Link your video to the Powderhorn Facebook page anytime between now and April 2nd. We'll spread it around via our other social networks! 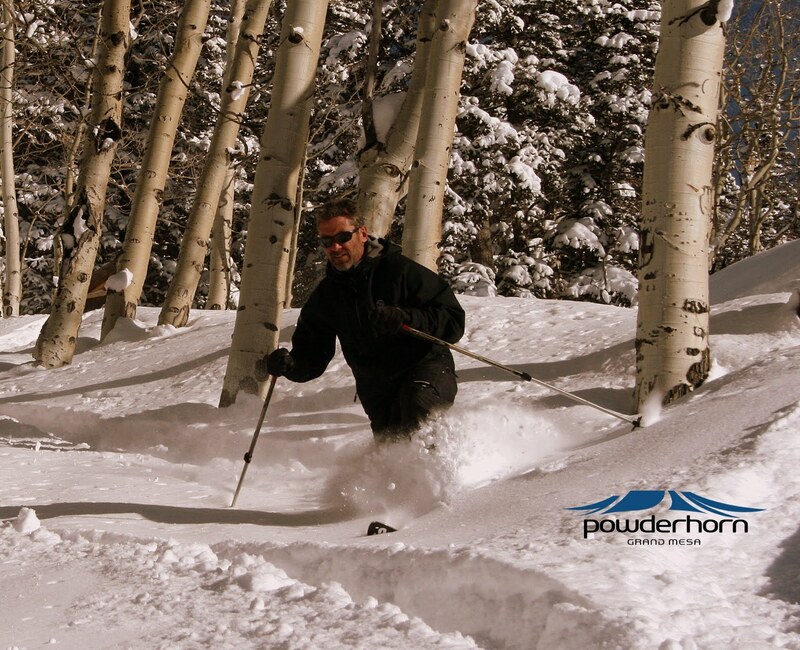 Anyone submitting an entry may be asked for permission and to sign a release allowing Powderhorn to use the video as a marketing tool in the future. Crossroads Fitness of Grand Junction are good friends of Powderhorn. They have two locations for getting your legs in shape before (or during) the ski season. This week, Crossroads is our local business focus as our Business of the Week partner. Check out their table in the Base Lodge lobby for coupons and deals. This Saturday, keep your eyes peeled for Crossroads water bottles hidden throughout the mountain. You'll find sweet prizes inside! Are you a Crossroads Fitness member? Bring your membership card all this week and receive 10% off lift tickets, lessons, rentals, merchandise at the Alpine Trader and food at the Sunset Grille. Available through Saturday, February 19th. It's been a week since the Super Bowl, but there's still a little family feud going on between a couple employees here. In this corner...Michele, weekend admin. assistant. Huge Steelers fan. In the other corner...John, snow removal manager. Huge Packers fan. Last weekend Michele had a massive display at the reception desk in support of her Steelers. 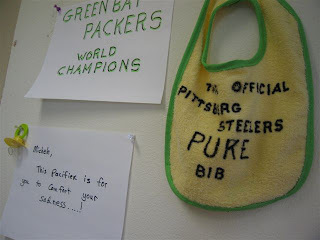 After her bitter loss, John did a little redecorating of her workspace, officially rubbing the Packer win in her face. I think this feud thing could last to the next Super Bowl. 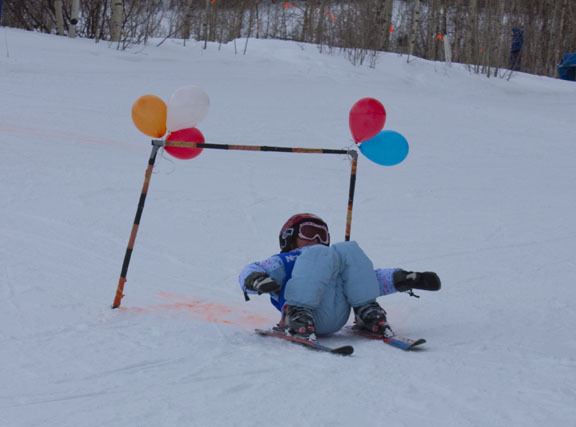 The 2nd Annual Dummy Jump is just a couple weeks away, February 26th to be exact. So it's time to start brainstorming and building! Those of you that witnessed the spectacle last year saw a variety of "dummies' launched off our huge jump- a washing machine, bathtub, go kart and even Richard Nixon. It's just $10 to enter a dummy. 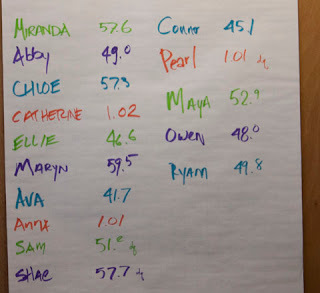 There will be prizes based on creativity and biggest/most spectacular/epic crash. Grab your buddies and start the plan. What could make the Dummy Jump even more fun? How about another SNOW BAR! 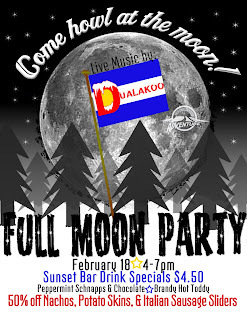 Right after the Dummy Jump, head down to the Snow Bar for another party in the snow with music, drink specials, door prizes and bonfire. The forecast called for 3-5". How about 14 instead? If you weren't here getting your face shots today, plan on it tomorrow. There'll still be goodies left over! 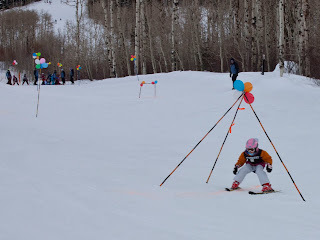 The grand finale of the 2010-2011 Powder Cats program was a downhill race through The Magic Forest with some unconventional gates and obstacles! 15 racers were cheered on by their team mates, family and coaches all the way to the balloon arch finish line! They celebrated after the race with juice and cookies, and were awarded certificates and goodie bags for their achievements this season! 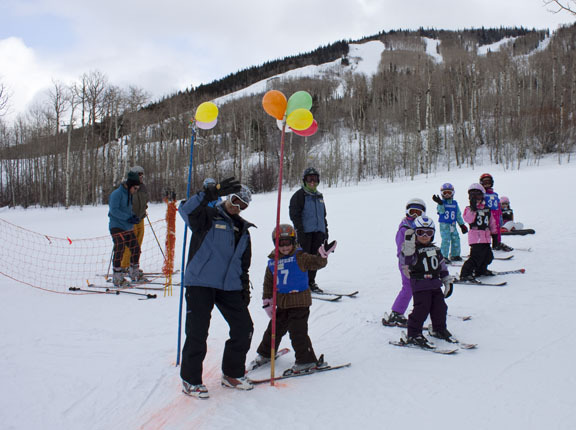 The Powder Cats will meet for two more fun days on the mountain to show off the skills they have learned in their lessons! 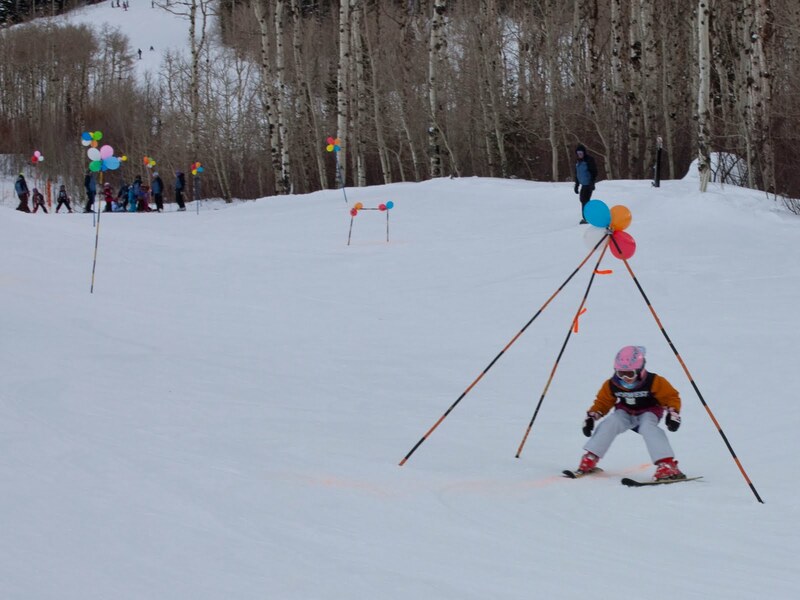 The Powder Cats program is designed for children 4-8 with an emphasis on safety, fun, skill improvement and exploring the mountain. All Powder Cats must exhibit the ability to stop before the first lesson, and they keep learning from there! Run: With 16" in the last 48 hours, everything is good. Powder pockets can still be found in the trees. Head for your personal stash! Event: It's a competition weekend. This Saturday is both the CDA Ski Challenge and the 3 Jump Jackpot. Speed or air? Take your pick. Perhaps a little of both? Get those adrenaline juices flowing. Gear: Hand warmers! They're a quick purchase and save your hooves. Buy these little packets of fire at the Alpine Trader or Guest Services. Food: There are a variety of hot soups each day at the Sunset Grille. I've gone through 6 bowls already this week. I'm taking the self-proclaimed Tour de Soup. 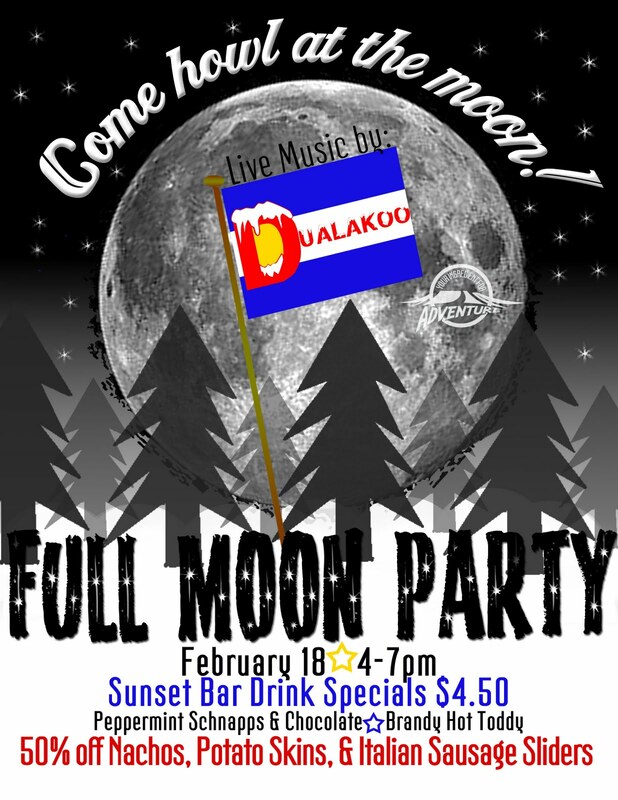 Apres: Check out Carl's Special at the Sunset Bar: scotch and 7 for just $2! Love to get big air? Got some good moves up there? 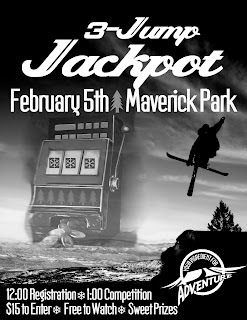 Strut your stuff at the 3 Jump Jackpot this Saturday February 5, and you could win yourself some sweet prizes [from Dakine! ], and maybe more importantly — bragging rights. 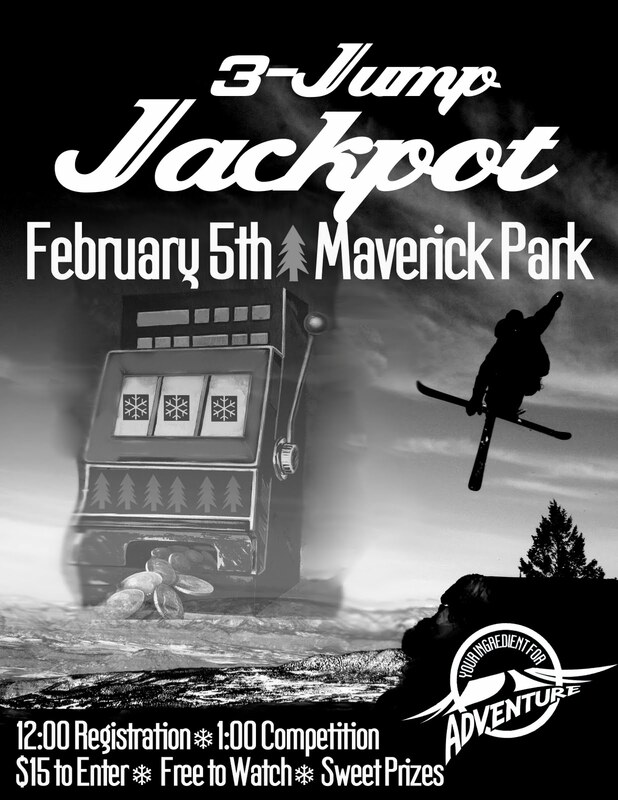 The competition will be held in the Maverick Terrain Park where, you guessed it, there will be three big jumps. 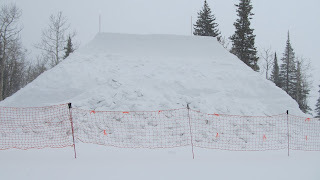 The 2 biggest jumps are ready and thanks to the big ol' storm we just got, we've got the white stuff piled up to build the 3rd jump this week. 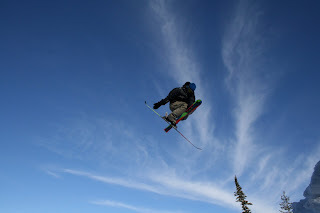 The competition is open to skiers and riders, guys and gals, pros and amatuers, of all ages. It's free to spectators, $15 to enter. Competitors must have a helmet and sign a release. Those under 18 need a signature from their parent or guardian to compete. Registration is at Noon, Jackpot starts at 1:00 pm. Don't forget your lucky charms.... and your game face, this is one jackpot that isn't ALL about luck. 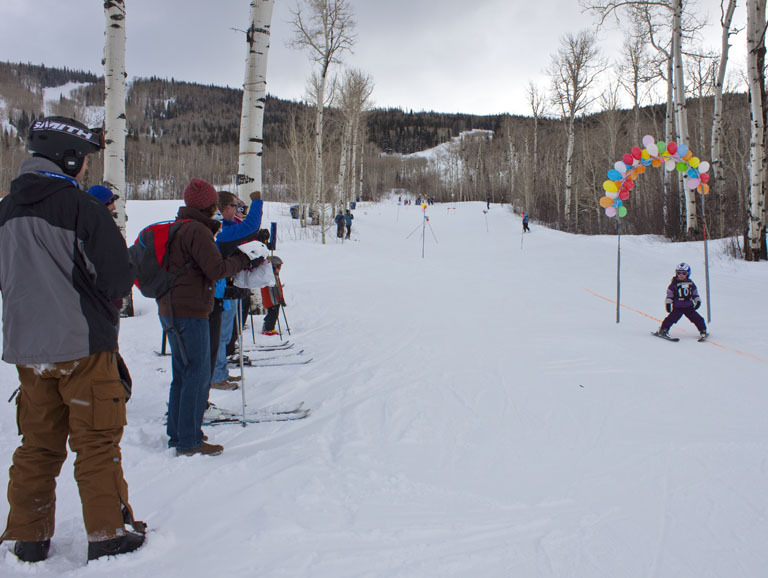 Photos from last year's 3 Jump Jack Pot here at Powderhorn. Despite bitter cold temps, many of you snagged first tracks this morning! The cold temperatures made the snow extra light and fun. Here's a quick video of some clips we got in Mad Dog Glade and Yoohoo.